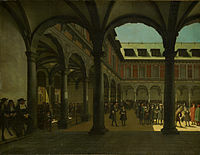 Courtyard of the Amsterdam Stock Exchange (Beurs van Hendrick de Keyser in Dutch), the foremost centre of global securities markets in the 17th century. 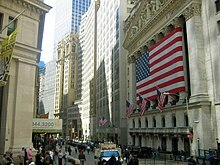 A stock market, equity market or share market is the aggregation of buyers and sellers (a loose network of economic transactions, not a physical facility or discrete entity) of stocks (also called shares), which represent ownership claims on businesses; these may include securities listed on a public stock exchange, as well as stock that is only traded privately. Examples of the latter include shares of private companies which are sold to investors through equity crowdfunding platforms. Stock exchanges list shares of common equity as well as other security types, e.g. corporate bonds and convertible bonds. Stocks are categorized in various ways. One way is by the country where the company is domiciled. For example, Nestlé and Novartis are domiciled in Switzerland, so they may be considered as part of the Swiss stock market, although their stock may also be traded on exchanges in other countries, for example, as American depository receipts (ADRs) on U.S. stock markets. As of 2017, the size of the world stock market (total market capitalization) was about US$79.225 trillion. By country, the largest market was the United States (about 34%), followed by Japan (about 6%) and the United Kingdom (about 6%). These numbers increased in 2013. Trade in stock markets means the transfer (in exchange for money) of a stock or security from a seller to a buyer. This requires these two parties to agree on a price. Equities (stocks or shares) confer an ownership interest in a particular company. Participants in the stock market range from small individual stock investors to larger investors, who can be based anywhere in the world, and may include banks, insurance companies, pension funds and hedge funds. Their buy or sell orders may be executed on their behalf by a stock exchange trader. People trading stock will prefer to trade on the most popular exchange since this gives the largest number of potential counter parties (buyers for a seller, sellers for a buyer) and probably the best price. However, there have always been alternatives such as brokers trying to bring parties together to trade outside the exchange. Some third markets that were popular are Instinet, and later Island and Archipelago (the latter two have since been acquired by Nasdaq and NYSE, respectively). One advantage is that this avoids the commissions of the exchange. However, it also has problems such as adverse selection. Financial regulators are probing dark pools. The rise of the institutional investor has brought with it some improvements in market operations. There has been a gradual tendency for "fixed" (and exorbitant) fees being reduced for all investors, partly from falling administration costs but also assisted by large institutions challenging brokers' oligopolistic approach to setting standardized fees. A current trend in stock market investments includes the decrease in fees due to computerized asset management termed robo-advisors within the industry. Automation has decreased portfolio management costs by lowering the cost associated with investing as a whole. In a 2003 paper by Vissing-Jørgensen attempts to explain disproportionate rates of participation along wealth and income groups as a function of fixed costs associated with investing. Her research concludes that a fixed cost of $200 per year is sufficient to explain why nearly half of all U.S. households do not participate in the market. Participation rates have been shown to strongly correlate with education levels, promoting the hypothesis that information and transaction costs of market participation are better absorbed by more educated households. Behavioral economists Harrison Hong, Jeffrey Kubik and Jeremy Stein suggest that sociability and participation rates of communities have a statistically significant impact on an individual’s decision to participate in the market. Their research indicates that social individuals living in states with higher than average participation rates are 5% more likely to participate than individuals that do not share those characteristics. This phenomenon also explained in cost terms. Knowledge of market functioning diffuses through communities and consequently lowers transaction costs associated with investing. Replica of an East Indiaman of the Dutch East India Company/United East Indies Company (VOC). The Dutch East India Company was the first corporation to be ever actually listed on an official stock exchange. In 1611, the world's first stock exchange (in its modern sense) was launched by the VOC in Amsterdam. 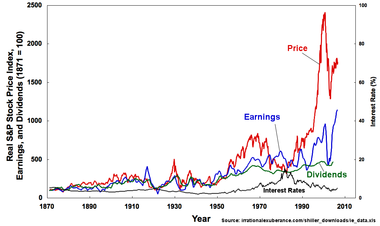 In Robert Shiller's own words, the VOC was "the first real important stock" in the history of finance. One of the oldest known stock certificates, issued by the VOC chamber of Enkhuizen, dated 9 Sep 1606. The first formal stock market in its modern sense – as one of the indispensable elements of modern capitalism – was a pioneering innovation by the VOC managers and shareholders in the early 1600s. Established in 1875, the Bombay Stock Exchange is Asia's first stock exchange. In the 17th and 18th centuries, the Dutch pioneered several financial innovations that helped lay the foundations of the modern financial system. While the Italian city-states produced the first transferable government bonds, they did not develop the other ingredient necessary to produce a fully fledged capital market: the stock market. In the early 1600s the Dutch East India Company (VOC) became the first company in history to issue bonds and shares of stock to the general public. As Edward Stringham (2015) notes, "companies with transferable shares date back to classical Rome, but these were usually not enduring endeavors and no considerable secondary market existed (Neal, 1997, p. 61)." 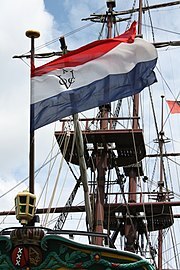 The Dutch East India Company (founded in the year of 1602) was also the first joint-stock company to get a fixed capital stock and as a result, continuous trade in company stock occurred on the Amsterdam Exchange. Soon thereafter, a lively trade in various derivatives, among which options and repos, emerged on the Amsterdam market. Dutch traders also pioneered short selling – a practice which was banned by the Dutch authorities as early as 1610. Amsterdam-based businessman Joseph de la Vega's Confusion de Confusiones (1688) was the earliest known book about stock trading and first book on the inner workings of the stock market (including the stock exchange). 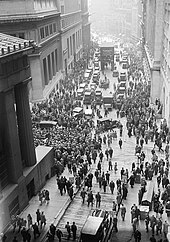 Crowd gathering on Wall Street (New York City) after the 1929 crash, one of the worst stock market crashes in history. The stock market is one of the most important ways for companies to raise money, along with debt markets which are generally more imposing but do not trade publicly. This allows businesses to be publicly traded, and raise additional financial capital for expansion by selling shares of ownership of the company in a public market. The liquidity that an exchange affords the investors enables their holders to quickly and easily sell securities. This is an attractive feature of investing in stocks, compared to other less liquid investments such as property and other immoveable assets. Sometimes, the market seems to react irrationally to economic or financial news, even if that news is likely to have no real effect on the fundamental value of securities itself. However, this market behaviour may be more apparent than real, since often such news was anticipated, and a counterreaction may occur if the news is better (or worse) than expected. Therefore, the stock market may be swayed in either direction by press releases, rumors, euphoria and mass panic. Price-Earnings ratios as a predictor of twenty-year returns based upon the plot by Robert Shiller (Figure 10.1, source). The horizontal axis shows the real price-earnings ratio of the S&P Composite Stock Price Index as computed in Irrational Exuberance (inflation adjusted price divided by the prior ten-year mean of inflation-adjusted earnings). The vertical axis shows the geometric average real annual return on investing in the S&P Composite Stock Price Index, reinvesting dividends, and selling twenty years later. Data from different twenty-year periods is color-coded as shown in the key. See also ten-year returns. Shiller states that this plot "confirms that long-term investors—investors who commit their money to an investment for ten full years—did do well when prices were low relative to earnings at the beginning of the ten years. Long-term investors would be well advised, individually, to lower their exposure to the stock market when it is high, as it has been recently, and get into the market when it is low." Additionally, many choose to invest via the index method. In this method, one holds a weighted or unweighted portfolio consisting of the entire stock market or some segment of the stock market (such as the S&P 500 or Wilshire 5000). The principal aim of this strategy is to maximize diversification, minimize taxes from too frequent trading, and ride the general trend of the stock market (which, in the U.S., has averaged nearly 10% per year, compounded annually, since World War II). Responsible investment emphasizes and requires a long term horizon on the basis of fundamental analysis only, avoiding hazards in the expected return of the investment; socially responsible investing is also recommended[by whom?] in all types of investment. According to much national or state legislation, a large array of fiscal obligations are taxed for capital gains. Taxes are charged by the state over the transactions, dividends and capital gains on the stock market, in particular in the stock exchanges. These fiscal obligations vary from jurisdiction to jurisdiction. Some countries[which?] avoid taxing profits on stocks as the profits are already taxed when companies file returns, but double taxation is common at some level in many countries. 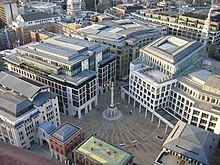 ^ The concept of the bourse (or the exchange) was 'invented' in the medieval Low Countries (most notably in predominantly Dutch-speaking cities like Bruges and Antwerp) before the birth of formal stock exchanges in the 17th century. Until the early 1600s, a bourse was not exactly a stock exchange in its modern sense. With the founding of the Dutch East India Company (VOC) in 1602 and the rise of Dutch capital markets in the early 17th century, the 'old' bourse (a place to trade commodities, government and municipal bonds) found a new purpose – a formal exchange that specialize in creating and sustaining secondary markets in the securities (such as bonds and shares of stock) issued by corporations – or a stock exchange as we know it today. ^ "Market capitalization of listed domestic companies (current US$)". The World Bank. Retrieved January 9, 2019. ^ "Global Stock Rally: World Market Cap Reached Record High In March | Seeking Alpha". ^ "All of the World's Stock Exchanges by Size". February 16, 2016. Retrieved September 29, 2016. ^ Murphy, Richard McGill (July 1, 2014). "Is Asia the next financial center of the world?". CNBC.com. Retrieved March 11, 2017. ^ "IBM Investor relations - FAQ | On what stock exchanges is IBM listed ?". IBM. ^ Ortega, Edgar; Yalman, Onaran (December 4, 2006). "UBS, Goldman Threaten NYSE, Nasdaq With Rival Stock Markets". Bloomberg.com. Retrieved May 31, 2011. ^ Mamudi, Sam (June 13, 2014). "Dark Pools Take Larger Share of Trades Amid SEC Scrutiny". Bloomberg. ^ "Market capitalization of listed domestic companies (current US$) | Data | Graph". data.worldbank.org. Retrieved December 17, 2015. ^ a b Statistical Abstract of the United States: 1995 (Report). United States Census Bureau. September 1995. p. 513. Retrieved December 17, 2015. ^ a b c d e Statistical Abstract of the United States: 2012 (Report). United States Census Bureau. August 2011. p. 730. Retrieved December 17, 2015. ^ Rydqvist, Kristian; Spizman, Joshua; Strebulaev, Ilya A. (January 1, 2013). "Government Policy and Ownership of Financial Assets". SSRN 1428442. ^ a b Changes in U.S. Family Finances from 2007 to 2010: Evidence from the Survey of Consumer Finances (PDF) (Report). Federal Reserve Board of Governors. June 2012. p. 24. Retrieved December 17, 2015. ^ a b c d Changes in U.S. Family Finances from 2010 to 2013: Evidence from the Survey of Consumer Finances (PDF) (Report). Federal Reserve Board of Governors. September 2014. p. 20. Retrieved December 17, 2015. ^ Vissing-Jørgensen, Annette (2003). "Perspectives on Behavioral Finance: Does 'Irrationality' Disappear with Wealth? Evidence from Expectations and Actions". NBER Macroeconomics Annual. 18: 139–194. CiteSeerX 10.1.1.195.7189. doi:10.1086/ma.18.3585252. ^ Hong, Harrison (February 2004). "Social Interaction and Stock-Market Participation". The Journal of Finance. 59: 137–163. doi:10.1111/j.1540-6261.2004.00629.x. ^ "16de eeuwse traditionele bak- en zandsteenarchitectuur Oude Beurs Antwerpen 1 (centrum) / Antwerp foto". Belgiumview.com. Retrieved March 5, 2010. ^ "World's oldest share". The World's Oldest Share. Retrieved August 8, 2017. ^ "Dutch history student finds world's oldest share". Guinness World Records Limited 2014. September 10, 2010. Retrieved August 8, 2017. ^ "Student finds oldest Dutch share". Radio Netherlands Worldwide. September 10, 2010. Archived from the original on August 8, 2014. Retrieved August 8, 2017. ^ Dunkley, Jamie (September 11, 2010). "Dutch student finds world's oldest share certificate". Telegraph.co.uk. Retrieved August 8, 2017. ^ Stringham, Edward Peter (October 5, 2015). "How Private Governance Made the Modern World Possible". Cato Unbound (www.cato-unbound.org). Retrieved August 15, 2017. ^ Tracy, James D. (1985). A Financial Revolution in the Habsburg Netherlands: Renten and Renteniers in the County of Holland, 1515–1565. University of California Press. ISBN 978-0-520-05425-7. ^ Goetzmann, William N.; Rouwenhorst, K. Geert (2005). The Origins of Value: The Financial Innovations that Created Modern Capital Markets. Oxford University Press. ISBN 978-0-19-517571-4. ^ Sylla, Richard (2015). "Financial Development, Corporations, and Inequality". (BHC-EBHA Meeting). As Richard Sylla (2015) notes, "In modern history, several nations had what some of us call financial revolutions. These can be thought of as creating in a short period of time all the key components of a modern financial system. The first was the Dutch Republic four centuries ago." ^ "World Federation of Exchanges Monthly YTD Data". World-exchanges.org. Archived from the original on June 11, 2011. Retrieved May 31, 2011. ^ "Equity market Size relative to bond markets and bank assets". eurocapitalmarkets.org. Retrieved August 14, 2015. ^ "Financial Stability Frameworks and the Role of Central Banks: Lessons from the Crisis" (PDF). ^ "Clearinghouse Definition & Example | Investing Answers". www.investinganswers.com. Retrieved October 20, 2015. ^ Levine, Ross (2002). "Bank-Based or Market-Based Financial Systems: Which Is Better?". Journal of Financial Intermediation. 11 (4): 398–428. CiteSeerX 10.1.1.196.658. doi:10.1006/jfin.2002.0341. ^ a b "Future of computer trading". www.gov.uk. Retrieved August 14, 2015. ^ Alexander, K.; Dhumale, R.; Eatwell, J. (2006). Global Governance of Financial Systems: The International Regulation of Systemic Risk. Oxford University Press. ISBN 978-0-19-516698-9. ^ "Historical Returns". nyu.edu. Retrieved August 14, 2015. ^ "OpenStax CNX". cnx.org. Rice University. Retrieved February 22, 2017. ^ Mandelbrot, Benoit & Hudson, Richard L. (2006). The Misbehavior of Markets: A Fractal View of Financial Turbulence, annot. ed. Basic Books. ISBN 978-0-465-04357-6. ^ Taleb, Nassim Nicholas (2008). Fooled by Randomness: The Hidden Role of Chance in Life and in the Markets, 2nd ed. Random House. ISBN 978-1-4000-6793-0. ^ Morris, Stephen; Shin, Hyun Song (1999). "Risk management with interdependent choice" (PDF). Oxford Review of Economic Policy. 15 (3): 52–62. CiteSeerX 10.1.1.381.3080. doi:10.1093/oxrep/15.3.52. ^ David Fabian (February 9, 2014). "Why The Market Doesn't Care Where You Think It Should Go". Seeking Alpha. Retrieved August 14, 2015. ^ "News Headlines". Cnbc.com. October 13, 2008. Retrieved March 5, 2010. ^ a b c Shiller, Robert (2005). Irrational Exuberance (2d ed.). Princeton University Press. ISBN 978-0-691-12335-6. ^ Chris Farrell. "Where are the circuit breakers". Archived from the original on October 28, 2008. Retrieved October 16, 2008. ^ Philip Ball (April 26, 2013). "Counting Google searches predicts market movements". Nature. Retrieved August 28, 2013. ^ Nick Bilton (April 26, 2013). "Google Search Terms Can Predict Stock Market, Study Finds". New York Times. Retrieved August 28, 2013. ^ Jason Palmer (April 25, 2013). "Google searches predict market moves". BBC. Retrieved August 28, 2013. Hamilton, W. P. (1922). The Stock Market Baraometer. New York: John Wiley & Sons Inc (1998 reprint). ISBN 978-0-471-24764-7. Look up stock market in Wiktionary, the free dictionary.